The interior of Seawalk 5 is nicely spacious, with three levels of living spaces to ensure plenty of privacy, as well as room to gather with the family. Enjoy a quiet night’s sleep in the top level or lower level bedrooms, and enjoy easy conversations in the kitchen / dining / living area here everyone can unwind with the ocean in the background. With a beautiful locale that’s complimented by a tastefully decorated interior, Seawalk 5 is a great escape for picture perfect beach vacations. Need more than one unit? Additional Seaside Vacations homes in the same complex: SW3, SW6, SW7, SW11, SW17, and SW18. First Floor - Entry; Master Bedroom with 2 Twins, TV, and Full Bathroom. Second Floor - Oceanfront Deck; Living Room with Flat Screen Television; Dining Area; Kitchen. Top Floor - Master Bedroom with Private Oceanfront Deck, Queen Bed, TV, and Full Bathroom; Full Hall Bathroom; Queen Bedroom with TV and Private Deck. 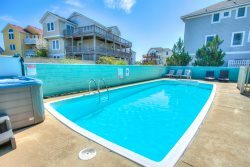 Exterior - Parking; Community Pool; Outside Shower; Direct Beach Access. Bedding: 2 Queens; 1 Twins and 1 Double. This was our first time staying at Seawalk Unit 5 and we highly recommend it!! The unit was clean and updated and you can't beat the location. Our maintenance request was addressed within 24 hours of completing the online request. We have already rebooked for next summer!! !